Can retail investors bag a unicorn? Investors often hear about high growth private companies, but can’t access a piece of the investment. So-called Unicorns, start-up companies that have reached a valuation of $1bn or more, have become more commonplace in recent years. Big names such as taxi-app Uber, accommodation website Airbnb and delivery company Deliveroo are still held privately and aren’t listed on the stock exchange. While many large institutional investors, such as pension funds and insurance companies, can invest in private companies, individual investors struggle to buy them directly. However, they can access a slice of the action through certain funds. Here we look at the different options. There is a grouping of investment trusts that invest solely in ‘private equity’ – so companies not listed on the stock exchange. These trusts look to invest in early-stage, high growth companies, which are often riskier than most. 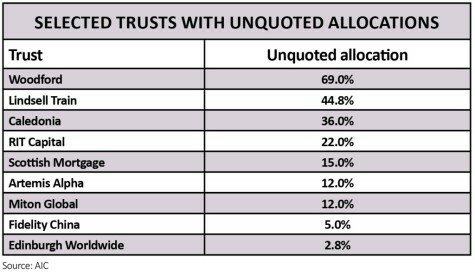 Some trusts invest directly in these start-up companies, while others have a ‘fund of fund’ structure and invest in other funds and trusts that are focused on private equity. Some split their money between the two approaches. One issue with these trusts is that they typically trade at a constant discount – meaning you can buy each share for less than the value of the underlying assets. Some investors see this as a buying opportunity, but not if the discount remains and doesn’t narrow. For example, Standard Life Private Equity (SLPE) currently trades at a 17.3% discount, ahead of its 14% 12-month average, while Apax Global Alpha (APAX) is on a 20% discount, compared to its 12-month average of 14%. However, this is far lower than in the financial crisis, when the sector averaged discounts of 60% or more at some points. But there is a potential double-discount on offer. Due to the unlisted nature of these trusts’ holdings, they are not valued daily like those with shares on the stock market. This means the net asset value figures of the trust can be out of date, and the actual discount will be much larger. Adding to this list recently is Old Mutual Global Investors, now rebranded as Merian Global Investors, which has just launched a new investment trust focused on unquoted companies called Merian Chrysalis (MERI). The trust raised £100m at launch, and originally aimed to invest in between seven and 15 unquoted companies. The team’s existing unlisted holdings in other funds they run include The Hut Group, TransferWise and Secret Escapes, which will likely make it into the new trust. Another option is to invest in funds that have a slice of their money in private companies, but still have a large portion in the public markets. Investment trusts are an ideal vehicle for these kind of investments – because they are closed-ended they are not going to be forced sellers of the private companies as a result of investor withdrawals. 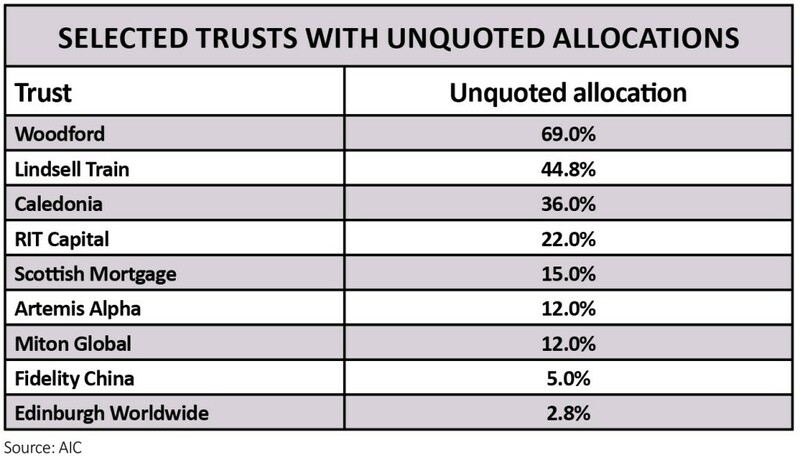 The £8bn Scottish Mortgage (SMT) investment trust has recently expanded its private allocation – in 2016 it increased the amount it could have in unquoted companies from 15% to 25%. It currently has 37 unlisted companies, which accounts for 15% of the portfolio. Earlier this year, its unlisted holdings included music streaming website Spotify, Airbnb and ride-sharing app (and Uber rival) Lyft. Another globally-focused example is the £2bn Caledonia Investment Trust (CLDN), which has a 36% allocation to unlisted companies but also invests in private equity funds, giving it further exposure to private businesses. Investors who feel particularly enthusiastic about the growth of start-ups in particular countries or regions also have options. For example, the Asia-focused Fidelity China Special Situations (FCSS) has 5% in unlisted investments at the moment, including ride sharing app Didi Chuxing and Chinese app developer Jiguang. Are investors overreacting to talk of a possible US ban on menthol cigarettes? Are we entering a bear market and does it matter? Do capital preservation funds perform as planned? Could logistics firms benefit from stockpiling ahead of Brexit?